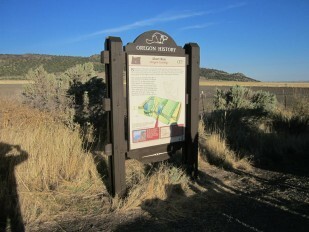 Oregon Travel Experience is the state’s official administrator of the Oregon Historical Marker Program. Oregon’s historical markers tout a history all their own—many of the famous Port Orford cedar “Beaver Boards” were built by the Oregon Department of Transportation in the 1940s, 50s and 60s. 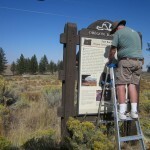 OTE adopted the program in 1991 and works with a team of dedicated volunteers in preserving the signs for future generations. 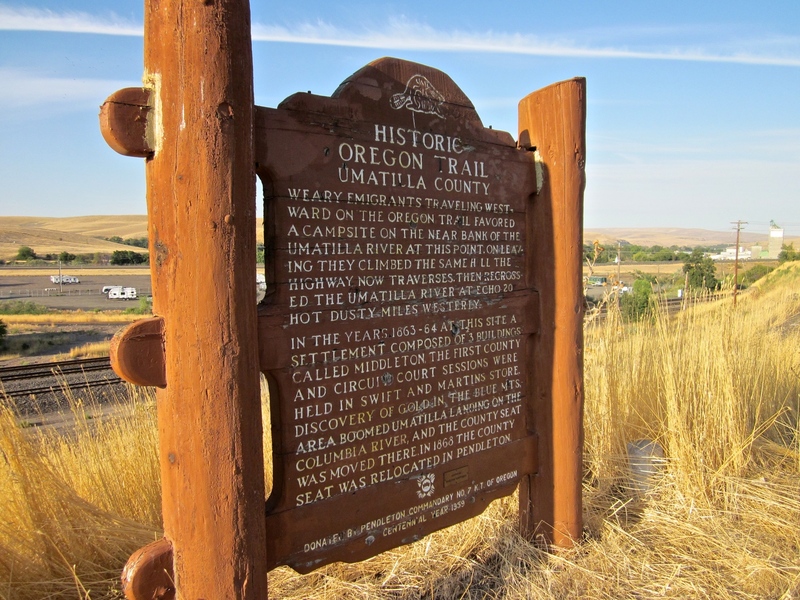 The program is steered by the Oregon Historical Marker Committee, which is staffed by volunteer professionals involved in Oregon forestry, geology, and historical and cultural research. In addition to members of the marker committee, the program relies on another important group of volunteers—volunteer master craftsmen based within a West Salem retirement community. The “Salemtowne Historical Marker Volunteers” could easily be called a linchpin of the program. 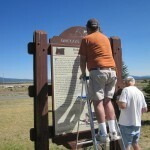 The group of approximately 10 men ensure that over 110 Historical Markers remain in good condition. Given the age of many of the markers, this is a supreme task. Salemtowne volunteers also tend to OTE’s more contemporary markers—colorfully illustrated signs printed onto weather-resistant material and mounted into cedar frames. 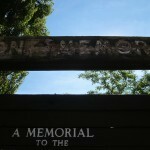 Both the old and new markers interpret Oregon’s stories, and reflect the changing perspective of our state’s history. However, with so many markers spread across the state, it takes the proverbial village to maintain them. The Salemtowne crew schedules regular road trips—visiting regions and out-of-the-way places to access markers in need of their TLC. 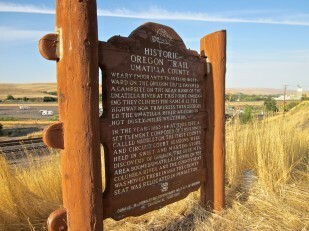 If you would like to read more about the process of maintaining and crafting Oregon Historical Markers, you can link to this story featuring one of our past Salemtowne Volunteers, Wayne Sharp. 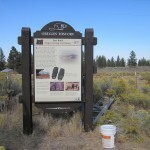 The image gallery below displays photos taken by the Salemtowne craftsmen as they visited Southern Oregon and other parts of the state on their 2015 “fix-it” trip. 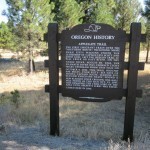 Applegate Trail Marker before (during restoration process). 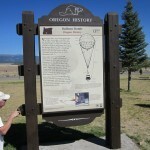 Volunteers work on the Balloon Bomb Marker in Bly. Volunteers show off the Balloon Bomb restoration. 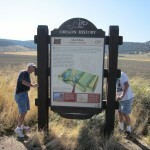 Volunteers inspect the Abert Rim Marker near Lakeview. The Abert Rim Marker following restoration work. 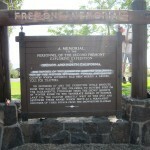 A close-up of the Fremont Memorial Marker (near Summer Lake) showing woodpecker holes and peeling paint. 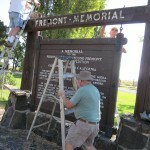 Salemtowne Volunteers performing restoration work on the Fremont Memorial. 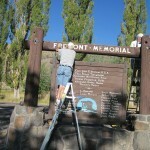 Another shot of the restoration work on the Fremont Memorial Marker. The volunteer crew patched the woodpecker holes in the marker. 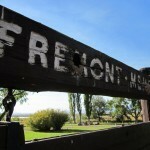 More patchwork on the holes of the Fremont Memorial Marker. Each stage of the rehab work is performed by the volunteers. 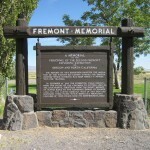 The Fremont Marker following its restoration. 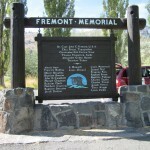 The Fremont Memorial Marker was two-sided, which makes the final results doubly impressive! 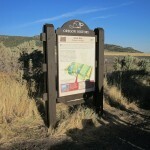 The Fort Rock Marker has a cedar frame, a routed beaver logo, and and a new-style interpretive metal sign. 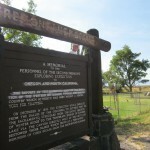 The Fort Rock Marker following its restoration.